As the European Region enters the warm season, the public, medical professionals and public health authorities must prepare for eventual heat-waves and hot spells. 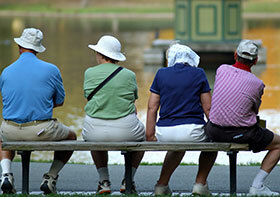 Every year, heat harms the health of many people, particularly the elderly. It can trigger exhaustion, heart attacks or confusion and can worsen existing conditions such as cardiovascular and respiratory diseases. Heat-waves are projected to increase because of climate change, but their health effects are largely preventable. WHO alert and information materials are available online to support preparedness and response to heatwaves. Follow your local health authority's recommendations. Keep your home cool, checking the temperature regularly. Ideally it should be kept below 32 °C during the day and 24 °C at night. Hanging shades across sunny windows, opening windows at night and early morning, and hanging wet towels to cool down the room air may help to lower the temperature inside. Keep out of the heat. Move to the coolest room in your house, especially at night. Avoid going outside during the hottest time of the day. Avoid strenuous physical activity if you can. Stay in the shade. Do not leave children or animals in parked vehicles. Keep the body cool and hydrated. Take cool showers or baths. Wear light, loose-fitting clothes of natural materials. Wear a wide-brimmed hat or cap and sunglasses. Use light bed linen and sheets, and no cushions, to avoid heat accumulation. Drink regularly, but avoid alcohol and too much caffeine and sugar. Eat small meals, and eat more often. Avoid foods that are high in protein. Help others, checking on family, friends and neighbours who spend much of their time alone. Elderly or sick people living alone should be visited at least daily. If a person is taking medication, ask the treating doctor how it can influence thermoregulation and the fluid balance. Seek medical advice if you are suffering from a chronic medical condition or are taking multiple medications. If you or others feel unwell—dizzy, weak, anxious, are intensely thirst or have a headache—seek help. Move to a cool place as soon as possible, and measure your body temperature. Drink water or fruit juice to rehydrate. Rest immediately in a cool place if you have painful muscular spasms; drink oral rehydration solutions containing electrolytes; and seek help if the heat cramps last more than an hour. Consult your doctor if you feel unusual symptoms or if symptoms persist. If someone has hot dry skin and delirium, convulsions and/or is unconscious, call a doctor or ambulance immediately. These materials are part of a wider portfolio of action for prevention, ranging from timely public and medical advice to health system preparedness, coordinated with meteorological early warning systems and improvements to housing and urban planning. These actions can be integrated into a heat–health action plan, and many European countries have developed such plans, to enable them to plan for heat and take action quickly.